The future of videogame advertising? Game streaming service Gaikai, which allows gamers to instantly try any demo of a game in a browser, has launched an open beta test this week. Invites have gone out to the first batch of 11,000 users, with CEO David Perry (he of Earthworm Jim fame) officially announcing that the beta test is open for business. 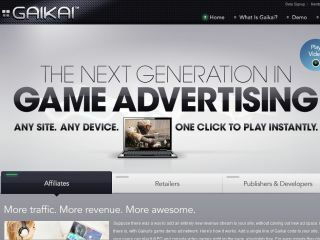 Unlike other streaming and cloud-gaming offerings from the likes of OnLive, Gaikai is looking to make money directly from videogame developers and publishers, by offering their customers the opportunity to test out demos of games instantly and for free. Gaikai plans to make its money based on the number of minutes users spend playing publisher's game demos. Perry confirmed in a blog post earlier this week that the first 1,000 invites were sent out on Sunday and will be followed by a further 10,000 this week. Perry added that 15 of Gaikai's 24 worldwide servers are currently being used in the open beta testing. "No issues have been reported that we can't fix this month, and so we will continue to send out invite blasts in waves of 10,000 until all issues are fixed," said Perry. The open beta is running BioWare's Mass Effect 2. Perry added that: "The Second Life team (from Linden Lab) has also been working away on a special build that they wanted to stream with no friction. They sent out a tweet and people started hitting the servers, it worked well." Whether cloud-gaming services such as OnLive and Gaikai can be proven to both work and capture the imagination of the gaming public in 2011 is one of the biggest questions being asked by games publishers and developers right now. Head over to Gaikai for more, or if you fancy getting involved in the beta test.